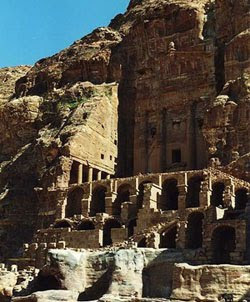 Located in the south west region of Jordan, Petra is the country’s premier tourist attraction. It is an ancient city with architecture never found anywhere in the world. Because of this distinction, UNESCO declared it as a World Heritage Site in 1986. The ancient city of Petra consists of structures carved in stone. It is believed that the structures have existed since the 15th century BC. Although some of the structures are in decline because of time, many still stand strong - a testament of remarkable engineering and architecture of the past. The structures are carved in Mt. Hor and the mountain actually has a significance in itself. It is believed that Moses’ brother Aaron was buried there. This is the reason why Mt. Hor is also known as Mt. Aaron. Although each structure is regarded with historical significance, some stand out because they have remained intact. Among them is the “El Deir” or the monastery as the carved columns are still preserved to this day. Another notable structure is the Urn Tomb as most of its architectural design still exists. Because of the city’s popularity, getting to Petra is very easy. There are buses that go to Petra and tourists can also rent taxis. Beautiful place....A worm red light (given by the reflexes of the light on the carved stones) will sourround you as soon as you arrive in Petra.....Definitely not to be missed the horse ride to get there! a very nice alternative to buses!